In this last week or two, a number of incidents have brought home that fact that I am really concerned about Edmodo. Not that I am anyone important, but I was the Edmodo administrator for my school division and am currently an Edmodo Certified Trainer. I’ve got a real stake in what they’ve got going on since I have been a strong advocate for the platform and have literally trained hundreds of teachers to implement its use. This convergence of items has me a bit worried. So the first thing that happened was a complaint from a teacher during a webinar. 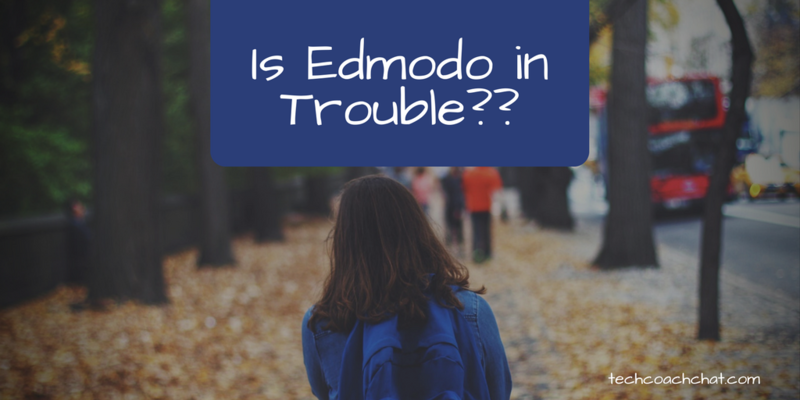 I had never heard a real complaint about Edmodo before, so I was stunned. Teachers had mentioned features they wished it had, but that happens with every tool. This was something else – and it was legitimate. Edmodo has been placing ads in the platform and emailing parents – and it places additional burden on teachers who need to explain these things to parents. It doesn’t really phase me given how I use the platform, but I could understand the concern. Then there were the whispers about the data breach. I hadn’t heard anything official, but there were a number of posts popping up asking for clarification about accounts that had been hacked. Then I was directed to this post and was shocked. Yes, people steal user account data all the time, but from children?? You have to wonder who would want to broker access to children’s accounts (yes, I know there are teachers, parents, and adult students also, but the platform was built for K12 use.). You also have to wonder why someone would want to purchase those types of accounts. BTW – Edmodo did send out an official email about the compromised data a few days ago. The third item was this post about tracking teachers and students. Tracking student activity isn’t cool. Granted, Edmodo explained that it was old code and removed it quickly after it was brought to their attention – with a bonus: they removed the ads. It also seems from their explanation that they tried to use a version Google’s DoubleClick that was not supposed to build a profile. If Edmodo was using Doubleclick for ad delivery, doesn’t that mean they needed the revenue? If they turned off the ads, then how will they try to get revenue in the future? Will Edmodo be able to recover from these two back to back issues?